Similar to the Yep Hell’s Gate Mod we posted a few weeks ago, the Chainsmoker Mechanical Box Mod includes dual 510 connections to fire two atomizers at once. You could use them individually, but the mod includes a special top cap that will link two atty’s together so you can take one MASSIVE PUFF. For the average person it’s a bit over the top, but it’s certainly an interesting option for true cloud chasers. 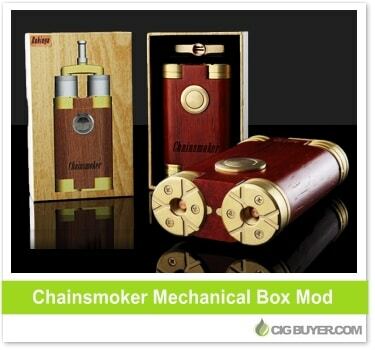 It’s made from brass and wood, takes two 18650 batteries and includes copper contacts and center pin.